Funding is now available to provide communities which develop a Community Response Plan with items to the value of £600 to create a Community Emergency Store. 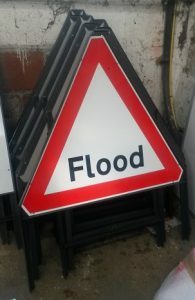 This can include road signage, hi viz clothing, sandbags, tools, communications equipment and other items. For further information about the scheme and to request support, please email llrprepared@leics.gov.uk. To see the progress of plans in your area, click on the ‘Plans Near you’ button on the right. This section provides advice to communities on preparing for emergencies. When a wide scale major incident occurs the Emergency Services have to focus their resources on helping the most vulnerable and those most badly affected, particularly when lives are at risk. It is therefore possible that your community might be affected but not receive immediate assistance because others are in greater need. It is for this reason we want to encourage our communities to be in a position to help themselves in those exceptional circumstances. Communities can do a great deal to help themselves, to support each other and to safeguard their most vulnerable members. A Community Response Plan will help you to identify the skills, knowledge and resources that can be mustered to help those within the community who have been affected. Is there a Community Response Plan for your locality? We want to encourage all communities to develop a Community Response Plan and some already have. See Plans Near You to see whether your community is one of them. If it is – why not get involved? If it is NOT – please read the Toolkit for ideas on getting the process going. You can also contact us to request support.